Meanderings and Reflections: Up, up and away . . . It's not an exaggeration if I proclaim myself as an Airport's child. I was born in an Airport colony with the sound of aeroplanes taking off and landing and my amma pointing out to the skies and feeding me mashed rice and potatoes. I was never a fussy eater says amma and obviously when one is shown the skies for small electronic birds, one would be awed beyond one's senses and something as trivial as food would become an enjoyable exercise. I grew up in another Airport colony looking at planes high above and loving the twinkling lights that were often mistaken for stars. Inspite of having lived and laughed in Airport colonies, I never had the experience of travelling in an airplane until recently. Aeroplanes and travel belonged to the rich and affluent but not for middle-class citizens like our family. The urge to look down on the earth was a very strong one and why not. 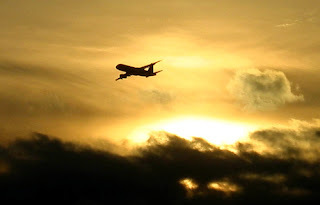 After all the words, 'Airport' and 'flights' were common parlance in our house, our neighbour's house and everyone with whom we socialised and prayed. So, sitting inside of an airplane was an eternal dream. When airplanes were shown on the Telly, I watched greedily and travelled in a fantasy flight to a land that was as fantastic as they showed in the pictures. When someone asked, what's you favourite dream, we would be quick to answer: To sit in an airplane and fly away. It seemed magical to think that one day we would have lots of money to be able to fly in an airplane. Friends whose parents were businessmen had the privilege of travelling to exotic locations like Hong Kong and Sri Lanka. We would be quite happy to listen to their stories while at the same time wishing that our parents could also afford such trips. The dreams soaked us so much that we soon grew up, fell in love and forgot all about planes. What mattered was the object of our affections and infatuations. And then one day, I was given the wonderful opportunity to go to Belfast, N. Ireland as an exchange student. More than going to Belfast, I was eager to fly in an airplane. I was 29. For 28 years, being an Airport's child, I had never flown. When the plane took off from Chennai's Airport, tears fell down my cheeks. I was overwhelmed and speechless that I didn't even feel the need to wipe the tears off. I let them fall. My first flight was to the UK and a long distance flight. After that first flight, I've had many opportunities to fly and every time the flight takes off (the best feeling), I remember the urge that I used to have in my childhood to fly in an airplane. These days it's not a big deal to fly. Everyone flies - children, young adults, old people and when I see them, I wonder about those days when we were children and waited for 28 long years before I could fly away. My grandfather is almost 85 and has worked in the Airport all his life until his retirement. He hasn't flown. I doubt whether he will ever be able to fly as he is bed-ridden and frail. I wonder whether he also had the same dream when he was in close proximity to a plane but never had the opportunity to fly in one. And the cherry on the cake is that even today I live next to an Airport and every day my ear drums take a toll as the jets from the naval base fly in and around our campus practicing various moves. When my husband and I sight a plane far off in the skies, we play a game of predicting what airline would the approaching flight belong to. It is a thrilling game to look up above and keep looking till the airplane flies beyond us. We smile at our attempts and soon there is another plane approaching. We continue our guessing game . . .
Nice one Susan :) The first experience is always one we all cherish ! Just one doubt though. How did you fly out of Kamaraj Terminal to the UK? Shouldn't it be the Anna International terminal? Loved this Susan..! I am yet to have the experience myself. Someday... maybe. Or not. WHo knows? OOh niceee! I've flown domestic only but as you say, each time the plane takes off, I have quite an emotional moment. I can't really explain what it is in words. But yes, been a while since I flew and I suppose I should soon! Quite a moving post Susan. Travelling in a plane had also been my most favourite childhood wish and I came to fulfill it only last year. :) I had the same nostalgic feeling when I read the lines where tears rolled down onto your cheeks as you sat on the plane to fly off to a faraway land. I could relate that experience when I took my first flight. And I do the guessing game as well. Nice One! Your post was a very nostalgic one cuz I had shared the same childhood dream as yours and I had got goosebumps when I boarded my first flight last year. Watching a plane land or take off is always a fascinating sight no matter how many times one has flown. But flights have lost their magic with security hassles,waiting hours, cramped seats....unless one has a private jet or business class tickets. I Absolutely love flying !I like the idea of getting into the plane and soarign high My favorite memory is when I was flying back from Leh and saw the Himalayas .. they were breathtaking ! Yes we always cherish our fist experience. I remember my first experience, I was in 4th standard and flew from Pune to Mumbai. It was a 15 minutes flight and the thrill of that moment is not yet forgotten. This post has a lot of heart, I enjoyed reading it a lot. I do not remember my first flight but even today I am very uneasy with turbulence and some funny landings. Btw, what do you mean "airport colony"? First time to come across the term. Your column today reminds me of a game my maternal grandfather and I used to play in the summer evenings when the sky darkened. After dinner we used to sit in the back yard of my grandparent's house and my grandfather and I would watch the sky and everytime we saw a plane with its lights fly across the sky we'd yell out Airplane! Such fun. --Thanks for the reminder. I am not very comfortable with heights. Even mountains make me slightly dizzy. So, I never had a fascination for air-travel. BTW, domestic flights la ye it's so boring... With the time it takes to fly long-distance, I wonder how you managed to pass the time. What did u do? That was so cute :-). The very thought of flying excites me and I vividly remember the first time I was aboard the plane. My joy knew no bounds when the place kicked off. Even today, as you say, I get excited when the plane takes off. Even otherwise, I love to watch planes take off from the ground, soaring to the skies, like a free bird! Susan, Your post brought back memories :) I too had traveled by air for the first time when I was 21 years old. It was a beautiful experience. Now you are staying in my old hometown, and I used to play this game too when I used to hear the planes flying overhead. My husband was in the Indian Navy, a pilot :) We were posted in Goa for 5 years way back in early 90s. It sounds like your fascination with planes will continue throughout your life. I wish you happy and safe flights. I don't like to fly. It scares me a little. But when I do I enjoy the naps I take to the sound of the humming engines. Enjoyed reading this! I too get fascinated whenever I hear a plane's sound. Naturally, I lift up my head to watch for a minute or two. The current generations, who are used to flying will never have this experience of enjoying first time flying...everybody gets everything without waiting for anything nowadays. My son flew to Boston when he was 19. He had never flown in a flight before that. I went to see him to California, after some years. That was my first flight experience! I can see you still enjoy airplanes! Happy feeling, right? Age 9 and I noticed a plane sputtering in the sky above our farm in early evening. He'd run out of gasoline. Farm hands helped him to carry gas from our overground tank to fill his plane's tank. Schedule was to leave at 8 AM, he stayed with us the night. OH! How I desired to be a fighter pilot! Never happened. But to this day--like you, Susan Deborah--often I anticipate and enjoy the flight more than arriving at a destination. I even schedule flights which have the most stop-overs! Aaah ! the guessing game...we played it too. The late night ride from Sterling Road to Marina beach...sitting on the beach...enjoying the orange lollies and guessing the planes crossing the skies. Thank u dear for bringing it all back. Miss all that and also miss u on my posts. Whenever you can pls do for i know u will like what u hear all I have to say. Leave a smiley if u r hard pressed for time and it would make my day. Love and all the best for ur work and everything. That was interesting. My father in law had his first flight when he was 85 and after that he he is being flying something like 6 times an year. Powerful memories, Susan and now you even live close to the airport :). How strange is it that the other day I was telling Sid that I still remember my first airplane journey that I made while I was doing my MBA and can still remember the exhilaration I felt. Alas, he made his first one while still an infant! When reality cracks memories . . .